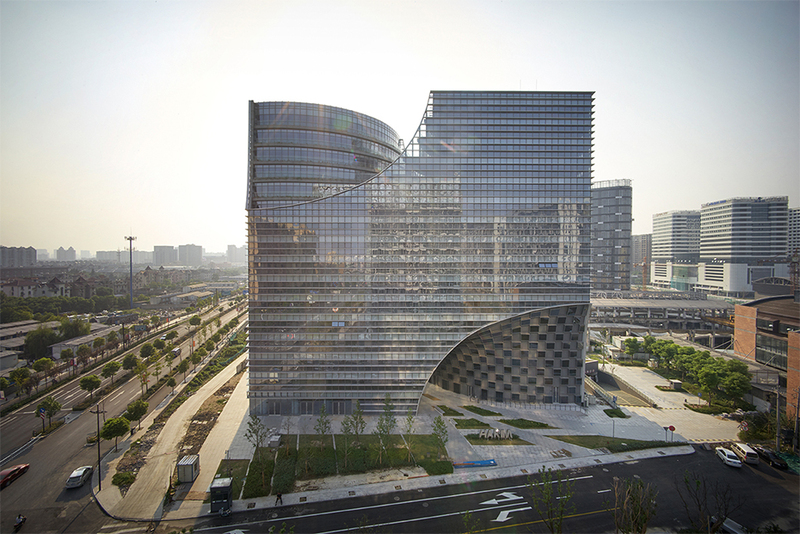 Our H project, headquarters of Internet service provider Hakim is completed in Hangzhou China. This 16-floor office building is a block the size of the site with two voids traversing the building diagonally in plan, creating an iconic H shape. The void through the bottom floors becomes an arch which serves as a covered public space and is oriented to create a pathway between the two urban centers surrounding the site. It establishes and enhances a connection throughout the overall master-plan by creating a green node. By lifting its mass into an arch the building recreates a gateway between two surrounding public spaces rather than a hindering wall of office space. The double curved surface of the arch and the graphic pattern of green space invites passers-by to meander through. The top void creates a stepped green recreational park reminiscent of ancient Chinese rice-field landscapes. The landscape also serves as rainwater retainer which re-uses natural water and cools down the building. It is oriented to provide maximum sunlight and views to the offices. Sunlight, access to fresh air and outdoor recreational space create a quality work environment. By carving out voids the building offers spaces at a human scale with specific qualities, contrasting with the undifferentiated space created by recent development in Chinese cities. The design engages with Hangzhou’s rich and diverse architectural history by reinterpreting the traditional Chinese gateway and reconnecting with the city’s tradition of proximity to nature.